Purefecto: Gaggan Restaurant, the best Indian food I ever had! Gaggan Restaurant, the best Indian food I ever had! 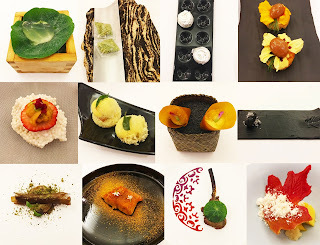 According to the World's Best 50 Restaurant Guide, Gaggan restaurant came in at number 10. It is the brainchild of Kolkata-born Gaggan Anand. Surprisingly the restaurant is NOT in India but in Bangkok, Thailand. I suppose close enough. I, for one, isn't crazy about Indian food in general. I like some dishes but honestly not enough for me to volunteer to go to an Indian restaurant. However, I was very curious about Gaggan and knowing that I will be in Bangkok and that this restaurant is in top 10 of World's Best 50 Restaurant Guide list, I figure it should minimally be good if not great. After the fabulous dinner I had there few weeks ago, let's just say if I live in Bangkok, I would come here every few months to eat! The food is that good! It's absolutely not to be missed when you come to Bangkok if you are a foodie. The prefixed menu started with bites such as "dew drop", "edible plastic spiced nuts", "foie gras sundae", etc. then the main entrees are compose of dishes called "magic mushroom", "story of fish called Kin-Medai", the obligatory "I want my Curry!!! ", etc. Just symphony of specialized herbs that only master chefs like Gaggan can pull off. And of course you get three desserts to top of a looong list of dishes with ingredients like pistachio cake, sake ice cream, and grape snow. I look forward to return to Gaggan in the future. I can't wait to see what new dishes he will have come up with when I come back next time.